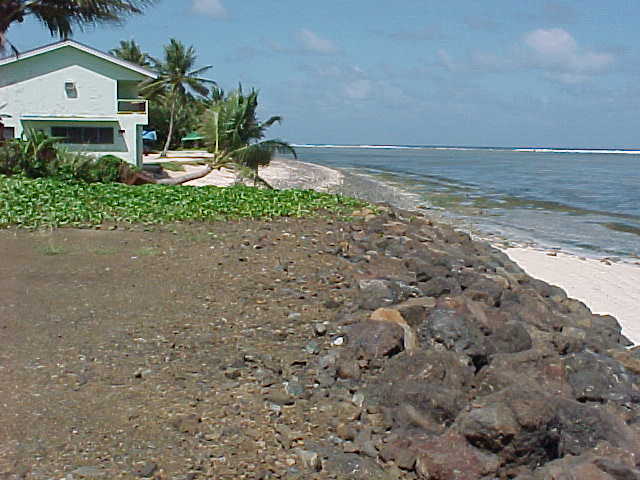 The causes of the coastal erosion problems on the north-east coast of Kosrae stems back over a number of decades before the Sandy Beach Hotel was constructed, relating to the removal of large quantities of coral rubble from the intertidal fringing reef during the initial development of the circumferential road. However, it was during the widening of the circumferential road in the late 1980s that problems began to occur. Widening the road extended it on to the upper part of the beach with some rock rubble protection installed to protect the road. This rock quickly moved off west due to the prevailing wave induced longshore transport, resulting in a layer of black volcanic rock covering the white sand beach fronting the hotel. Over the subsequent decade various gabion defences were installed to protect sections of the road, with the length of the defence ever increasing. However, due to the exposed nature of the north-east coast, the gabion baskets quickly broke down, releasing more volcanic rock that ended up covering the beach at the hotel resulting in a legal trial concerning the removal of the rocks from the hotel frontage. Closure of the Insrefusr Channel to the east is unlikely to have been a major factor contributing to the erosion at Sandy Beach. A more substantial and longer rock armoured revetment was completed in 1998 which extended to the eastern boundary of the Sandy Beach Hotel. In the months following the construction, accelerated erosion occurred immediately to the western end of the rock revetment, undermining the Sandy Beach restaurant foundations and resulting in a net loss of beach along the entire frontage of the hotel. 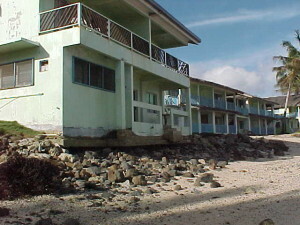 High tides and waves during December 1999 resulted in further loss of beach along the Sandy Beach frontage threatening most of the hotel property. Erosion on the north-east coast of Kosrae has been dominantly caused by a combination of human actions over a period of decades that continued to scale and complexity of the problem. 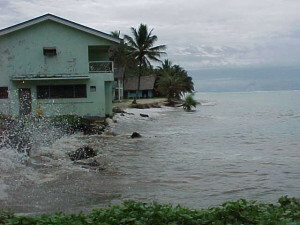 The construction of linear, hard defences, such as revetments or seawalls, or structures that block the longshore movement of beach sands, on the open coast beach areas of Kosrae will tend to lead to undesirable further environmental impacts, such as exacerbated erosion and loss of beach protection elsewhere. Once structures have been built and detrimental impacts have started it is difficult to stop such impacts occurring – avoid this occurring in the first place. Avoid the temptation to try to engineer your way out of the problem by continuing to build larger and longer seawalls – defence addiction – once you start you just can’t stop. The entire north-east coast between Tafunsak and Finpukal. The north-west facing Walung coast.